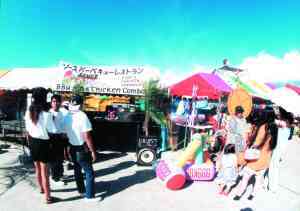 Fireworks and fun will be the main themes from June 30 through July 1 as Kadena Air Base opens its gates to the public for its annual open house AmericaFest 2001. The festival will run from 11 a.m. to 10 p.m. on both days. The two-day event offers again plenty of food, games, rides, entertainment and culture, not to mention a spectacular fireworks display on both nights. An important part of the festival is the static displays of various aircraft in the U.S. Air Force Arsenal that thousands upon thousands local and not so local nationals almost religiously make pilgrimage to see. The Japanese Self Defense Air Force also brings their aircraft for display. One special caution to visitors who come to the grounds on daytime. There are very few shaded areas at the festival grounds and the black tarmac amplifies the heat from the sun. A hat, strong sunscreen lotion or some other protection against the sun is highly recommended. Festival goers are also advised to drink plenty of fluids as a precaution against dehydration. Another rule to remember is to make sure to avoid drinking and driving. Better safe than sorry, so those who are planning to have a couple of suds while enjoying the show would do wise to leave the car home and take a shuttle bus or taxi to and from the area.